Motorists planning to use one of the bridges spanning the Hudson River north of New York City can expect traffic delays late Saturday morning as two of the span's anniversaries are commemorated. The New York State Bridge Authority says a motorcade of vintage cars from the 1920s and `30s will traverse the Bear Mountain Bridge, which connects Orange and Westchester counties. The motorcade will start on the Orange County side and pause briefly on the span for a ribbon-cutting ceremony at 10:25 a.m.
Officials say traffic will be stopped for the event and delays are expected until around 11:30 a.m. The event commemorates the 90th anniversary of the bridge's dedication and the 75th anniversary of the span's purchase by the bridge authority. The span was the first vehicular river crossing built between New York City and Manhattan. Tickets are $25 in advance; $30 day of the tour. STAATSBURG — Decorated for the holidays in the elaborate style only the Gilded Age of the late 19th and early 20th centuries could produce, the Staatsburgh State Historic Site is offering guests of the Mills Mansion a chance to travel back in time to get a feel for what life was like in the Hudson Valley 100 years ago. For adults, it's an opportunity to tour the mansion and view the exquisite holiday decorations — from the traditional Christmas tree in the main hall to the dining room table — an annual highlight among the seasonal decorations that will mirror the 17th-century Belgian tapestries hanging in the dining room. As parents are perusing the mansion's rooms, eight of which are decorated for the holidays, the kids can try to solve a mansion mystery as part of the site's traditional Holiday Whodunit. For the past five years, the Hudson Valley home of Ogden and Ruth Livingston Mills, on Old Post Road, has hosted the children's Holiday Whodunit, allowing kids to tour the mansion at their own pace, find clues and solve a mystery, said Donald Fraser, educator for the Staatsburgh State Historic Site. "We like to give the kids a flavor of what life was like 100 years ago, so there's an educational component to it as well," Fraser said. "In past years, there's generally something missing that the kids have to find and this year, it's more of a scavenger hunt." In the program that runs from 1 to 4 p.m. every Sunday through Dec. 26, children ages 6-12 can attempt to find some of Ruth Livingston Mills' belongings she needs in order to see "The Nutcracker" at the Bardavon 1869 Opera House in Poughkeepsie, or so the story goes. The kids are given that brief introduction before being sent to find such items as opera glasses, a fan, a shawl and gloves. The story is set in 1910, when Halley's Comet was seen by guests at the Mills Mansion, adding to the background and educational content of the story, Fraser said. "What we've done the last few years is try to have the story set 100 years from the present year," Fraser said. "Last year it was called The Case of the Filched Fulton and this year we're calling it The Halley's Comet Holiday Whodunit." Last year marked the bicentennial celebration of Robert Fulton's first successful commercial voyage of the steamboat in 1809, and the mystery at Mills Mansion was based on the 100th anniversary of that achievement in 1909. Nearly a half-dozen volunteers are stationed throughout the mansion, dressed in period costumes, to answer children's questions and help them solve each clue, Fraser said. "The tour is set up to be a straight run or if the kids want to, they can go back and re-interview some of the guests and servants in the mansion," Fraser said. "There is a variation between children, some who are awfully shy where the volunteers have to be forthcoming and ask the kids leading questions, and others who are really detectives and grill the volunteers." Mills Mansion has a dedicated crew of volunteers who assist each year in decorating the house, including a pair of women who annually iron the Christmas bows, Fraser said. The house is open from 11 a.m. to 4 p.m., when the last tour begins, Wednesdays through Sundays, until Dec. 31. Admission is $5 for adults, $4 for seniors and students, and free for children under 12, so all kids participating in the Holiday Whodunit are allowed free admission. 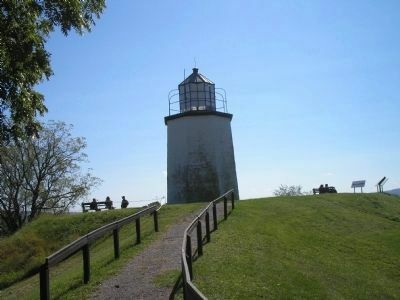 For information, contact the Staatsburgh State Historic Site at 845-889-8851 or visit www.staatsburgh.org. Held in conjunction with the Friends of Clermont’s regularly scheduled meeting, the lecture was presented by the Clermont State Historic Site and the Friends of Clermont, and was made possible by an endowment from the Speakers in the Humanities program of the New York Council for the Humanities. Started in 1983, the Speakers in Humanities program links scholars with diverse audiences through the presentations of lectures on various topics. Seats filled up quickly at Village Hall to hear Scherer, a fine art and classical music critic for the Wall Street Journal, writer of the Antiques magazine column “The New Collector” and visiting professor at Sarah Lawrence College, speak about the historic architecture of the Hudson River Valley, as he has been doing across New York State since becoming a Speaker in the Humanities for the New York Council for the Humanities. He has also lectured on the arts at such venues as Lincoln Center in Manhattan and the National Gallery in Washington, D.C. The homes that popped up along the shores of the Hudson during that time were called “villas” in architectural terms; large, luxurious residences arranged around a central courtyard, with expansive farmland surrounding it on the rest of the property. The Roman idea of a villa spread throughout the world during the Renaissance, explained Scherer: “Italy revived … the idea of living graciously in the country.” As more wealth moved into the Hudson Valley, this idea caught on even further and was popularized by architects Andrew Jackson Downing and Alexander Jackson Davis. Scherer presented a slideshow of different historic Hudson River estates to demonstrate the development and variety of the Hudson River villa, as well as some constants throughout all of them. Being perched on the banks of the Hudson, the construction of a Hudson River villa demanded the incorporation of a lookout point. 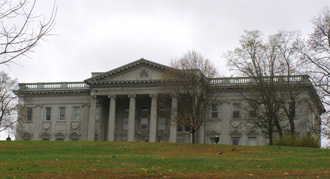 The façades of nearly every home shown in Scherer’s slide show presentation, including a handful in Westchester County, Frederic Church’s Olana in Hudson, the Samuel Morse estate (Locust Grove) in Poughkeepsie and the Clermont State Historic Site in Germantown (which belonged to the affluent Livingston family), prominently featured towers or cupolas (or both) in order for the homeowner to get an optimal view of the pastoral beauty that surrounded them. 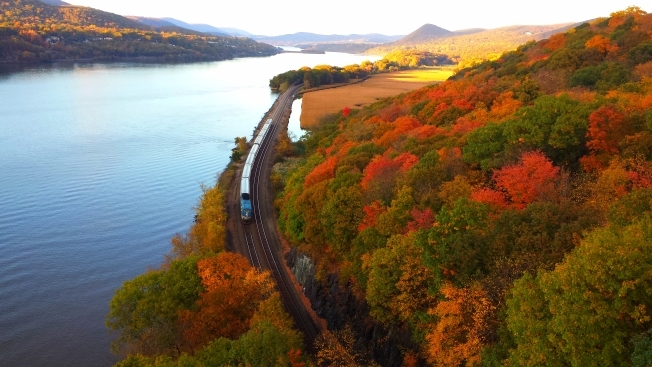 “If you overlook the Hudson, you have to have that point of view – you need a vantage point,” said Scherer. Another common thread of the Hudson River homes of these centuries was the cluttered feel of the living areas. Chairs, lamps, books and tables are piled seemingly on top of each other in shots of artist Thomas Rositter’s 1860 villa in Cold Spring. “Historic 19th century interiors in the Hudson Valley blend comfort with – how shall I put this? – tons of stuff,” said Scherer. Oriental rugs, elaborately molded ceilings, gasolier lighting and porcelain are also common items that dominated historic Hudson River villa interiors. But other estates’ owners took the romantic design of the villa to an entirely new and unique level. In particular, Church – one of the original painters of the Hudson River School – hired one person to design the Olana estate in 1867, but after returning from a trip to the East with his wife, paid the man to walk away and hired someone else to carry out his newfound oriental vision for his home. Scherer closed his presentation with a montage of paintings by the original Hudson River School artists. These individuals, who drew constant inspiration from the natural beauty of the Hudson Valley, treasured the local landscape so much that it clearly influenced every architectural detail of the homes they decided to build here and which still stand today, most of them stunningly preserved. “Everyone knows that artists love the Hudson Valley,” said Scherer. To reach reporter Lindsay Suchow, call 518-828-1616, ext. 2259, or emaillsuchow@registerstar.com. "The Times That Try Men's Souls"
Fort Lee was constructed in 1776 to be used in conjunction with Fort Washington, located diagonally to the north on the opposite side of the Hudson River as a means of closing the vital waterway to British shipping. On November 20, 1776, British General, Cornwallis, ferried about 5,000 men across the Hudson River north of Fort Lee. When word reached George Washington, he ordered an immediate retreat from Fort Lee before his army could be cut off and captured by the British. Most of the American supplies and artillery had to be left behind. These were indeed the darkest days for the Revolution and led to Thomas Paine's famous words, "These are the times that try men's souls…"
Members from over a dozen Living History groups will commemorate the 234th Anniversary of the British Invasion of New Jersey at Fort Lee Historic Park on the weekend of 20 & 21 November 2010. Re-enactors representing Continentals, Militia, British, Hessian & Loyalist troops will take part in different field and camp activities throughout the weekend. 10:00 AM Camps Open to the Public. 12:00 Noon Parade to Monument Park. 1:45 PM Pay Call in camp. 3:00 PM Battle of the Blockhouse.